Jessica Holt is a first-year MFA Directing student from Phoenix, Arizona. She earned her BFA in Acting from Utah State University where she also studied directing. Jessica taught high school theatre for six years in addition to serving as adjunct faculty at a community college. She earned her Master of Theater Studies in Production and Design from Southern Oregon University. 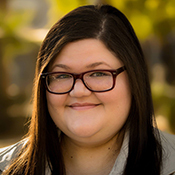 Jessica has worked at many theatres across the greater Phoenix area as a director, actor, stage manager, and sound designer. Favorite directing credits include Midsummer Night's Dream, The Drowsy Chaperone, Red Light Winter, and Night Watch.